Children's birthday party favors are nearly a necessity for any child's birthday party these days. Kids and parents alike expect children will be given goody bags to take home or some little present or token of appreciation that they attended your child's big day. While giving gifts to every child can get expensive, there are some easy and inexpensive children's birthday party favors you can try at your next party. One thing that is great about children's birthdays is there is usually a built in theme revolving around your child's favorite cartoon or movie character of the moment. Marketers know that kids love characters, and all the party supply stores know it. These stores, and even discount stores and dollar stores, are packed with plates, cups, napkins, streamers and other decorations covered with the faces of your child's favorite characters. You can often find fun little toys related to those characters at party stores and dollar stores. The toys at dollar stores sometimes are not exactly the same characters, but they still relate to your theme and will save you a lot of money. Another option when look for children's birthday party favors having to do with characters is to search the Internet for printables. Printables are free coloring pages, activity pages, stories, songs and other fun things for kids related to the character of choice. To find printables, search the Internet for your character and printables. Just as an example I searched for Blue's Clues and found a great page at Nick Jr. with a ton of different activity pages. All you have to do is print them out (make copies on a copy machine if you don't have a good printer) bind them together with some ribbon, add a cardboard or card stock cover and maybe a pack of crayons for each child and you've got a quick party favor that can also be an activity at the party. A really fun children's birthday party favor idea is to make a grab bag or goody bag for each of the children, again related to the theme of the party. This can get pretty expensive if you don't watch out. The dollar store and sale bins are your friend. One great place to shop for fun little trinkets, whether you're working with a theme or not, is Oriental Trading Company. This company started as a catalog business and has long been known by teachers and the budget-conscious as a good place to buy party supplies, arts and crafts supplies, little toys, holiday decorations and much more. You can search by party theme or just browse the site to find trinkets you think the kids coming to your party would like. A great example is the pirate party. You can purchase plates, cups, napkins, tablecloths and other needed goods here, but you can also buy temporary tattoos, kits to make foam pirate hats, eye patches, treasure boxes, earrings, bandanas, suckers, stickers and more. Most items are sold in bulk so you're already saving money and buying a couple of these things would allow you to put together great children's birthday party favors that everyone will love. A lot of people have gotten away from favors of food because there are so many children who are sensitive to different foods or have restrictive diets. If you really want to share a special family recipe with your kid's friends, make sure you check with all the parents so you know if there's anyone who can't eat it. You don't want anyone to feel left out. The main thing to remember when thinking about children's birthday party favors is that you don't have to spend a fortune. These little gifts should be fun for the kids, but they also should be fun for you. If trying to figure out what kind of favors to offer is stressing you out, throw together an assortment of candy in your child's favorite color (again making sure there aren't any kids who aren't allowed sugar), put it in a clear cellophane bag with a cute bow and you're done. The kids probably won't remember the birthday party favors they received from one party to the next, so don't sweat it. 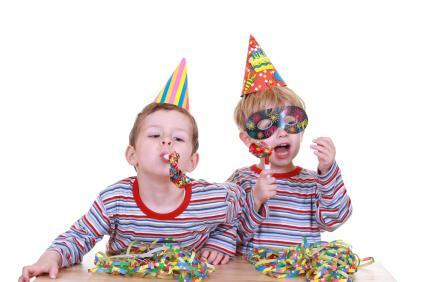 Have fun celebrating your child's birthday with all of his or her friends.